As I was cleaning off my back porch yesterday, I also did some garden maintenance. I checked the agrilife extension recommendations for what to plant around here and when, and found out it's time to say goodbye to my spring babies. So I cut down two of my tomato plants that weren't producing anyway, and potted some still-small brethren that have been living in milk jugs all year. Of course then the kids got out there in the yard with me, too. And then it started to rain. Finally! Something to fill my rain barrel! Or at least half fill it. The kids also loved getting muddy. Surprise. 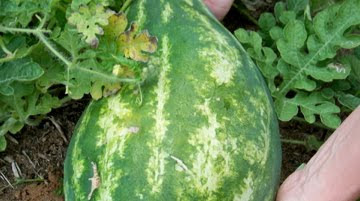 Do you remember my watermelon patch? 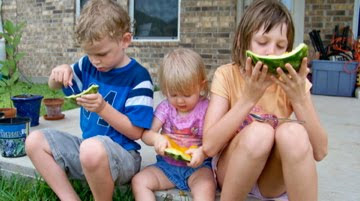 I have been wondering how to tell if a melon is ready. I heard to check the underside for a white spot, and the stem for signs of browning. The big melon in my patch of seven has been showing zero signs of readiness. Then yesterday, it showed the ultimate sign of readiness. During the rain, Rooster picked up a terra cotta saucer full of rainwater and showered it on the melon. Then he dropped the saucer on the melon. Oops. Have you ever heard the expression, "Split like a ripe melon"? That melon split open six ways from Sunday. It was ripe, all right. 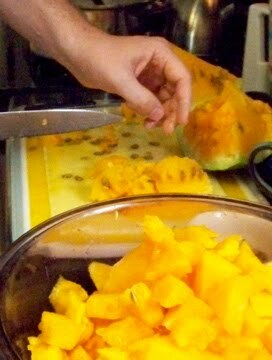 Have I mentioned it is a yellow melon vine? Fortunately for Rooster, he did not receive the beating of his life the melon was sweet and perfectly ready to be harvested. 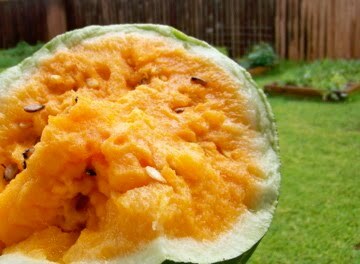 In fact, had we waited much longer, it may have split open on its own and been sacrificed to the ants and other melon-loving critters in the garden. The Captain was so excited he immediately took a time-out from work to cut it up. The kids then took the rinds to my freshly swept porch and gnawed off the rest of the flesh to their hearts' content. The rest was savored with dinner. Just a taste of golden summer wonder. I am sure my dad will be glad to know that someone enjoyed growing his watermelon seeds.